Instant Pot Chicken Tacos are such a great dinner idea any time of year, and we searched out the most interesting chicken tacos we could find for this collection of Food Bloggers’ BEST Instant Pot Chicken Tacos. Click here to Pin Food Bloggers BEST Instant Pot Chicken Tacos! 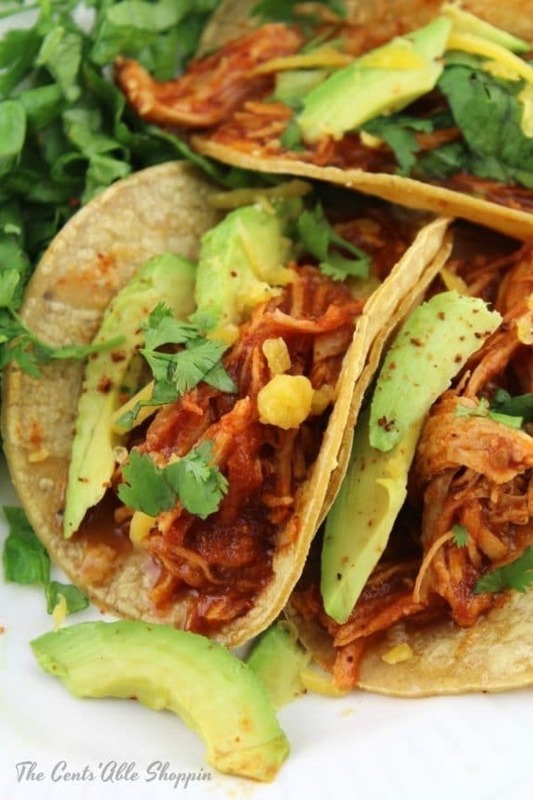 Click here to see The Best Slow Cooker Chicken Tacos From Food Bloggers! I bet one of these recipe for Instant Pot Chicken Tacos would be a popular dinner in most households, even when it’s not Taco Tuesday. And there are so many fun ways to make chicken tacos more interesting that we had fun assembling this collection of Food Bloggers BEST Instant Pot Chicken Tacos to give you lots of chicken taco options. 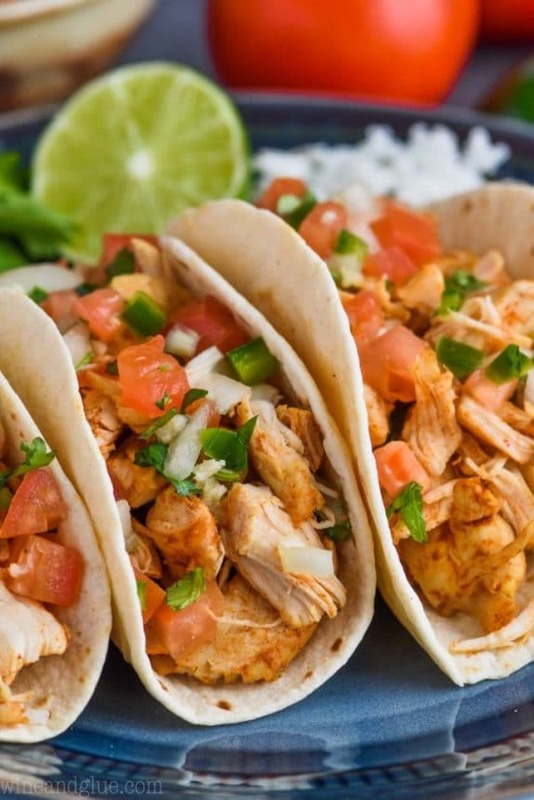 You can find Instant Pot Chicken Tacos here with flour or corn tortillas, and the tacos use a variety of tasty toppings like lettuce, tomatoes, onions, olives, radishes, cheese, green onion, jalapenos, sour cream, avocado, pineapple, or slaw. And the shredded chicken is flavored with a variety of spices and seasonings and flavor-enhancing additions like Buffalo sauce, pineapple juice, salsa, and of course taco sauce and taco seasoning. I hope you’ll find a new variation of Instant Pot Chicken Tacos here that will become requested dinner in your family. And if you already have a family-favorite recipe for chicken tacos, let us know about it in the comments! All photos are copyrighted to the blog that posted the recipe. Just click the recipe title under any photo to see the complete recipe on the original site. You can’t go wrong with these Instant Pot Chicken Tacos from Wine and Glue, as these tacos have only 3 ingredients and will be done in just under 30 minutes! Your family will love them! These flavorful Instant Pot (or Slow Cooker) Low-Carb Cheesy Chicken Tacos from Kalyn’s Kitchen are simply incredible! The deliciously-cheesy taste will treat your family to some of the best tacos they’ve ever tasted! Instant Pot Chicken Ranch Tacos from Mountain Mama Cooks are a family favorite at Kelley’s house. The salsa verde and ranch make a delicious taco that you will want to try for dinner tonight! Holly from Spend With Pennies says these Instant Pot Chicken Tacos are quick and easy to prepare! You can choose to wrap the chicken with corn or flour tortillas, add your favorite toppings, and your family will enjoy a satisfying meal. Instant Pot/Slow Cooker 3 Ingredient Lime Chicken Tacos from 365 Days of Slow Cooking start with a little taco sauce, some seasoning, and frozen or fresh chicken breasts. The end result is a tasty and satisfying chicken taco meal! 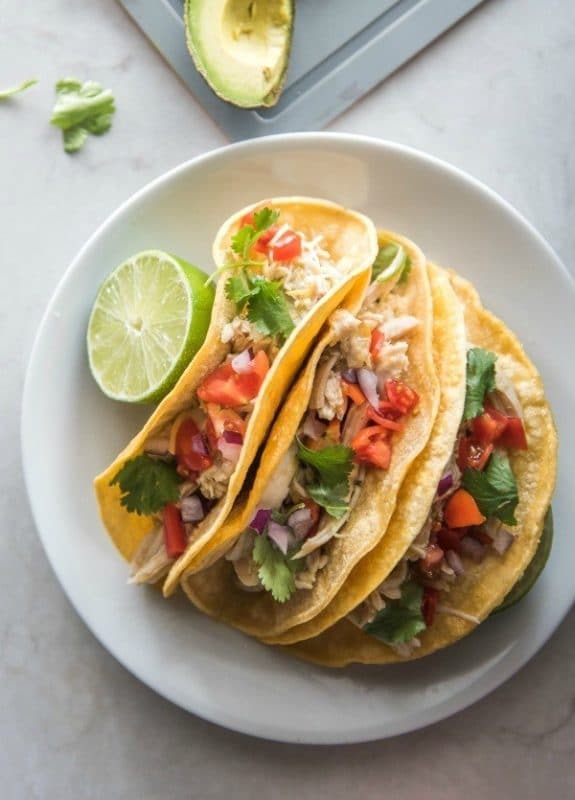 For a trusty, easy standby recipe, make Instant Pot Shredded Chicken Tacos from Well Plated. The chipotle chiles give the chicken a deep smokey flavor that suggests it’s been cooking for hours instead of only 8 minutes in the pressure cooker. You will love the juicy tender chicken and the faster cooking time! 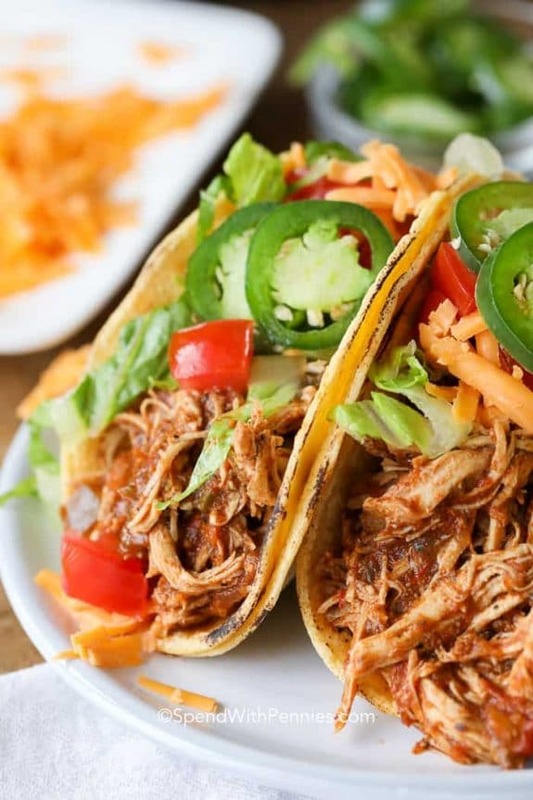 Instant Pot or Slow Cooker Salsa Chicken Tacos from Cooking Classy are so flavorful and easy to make. 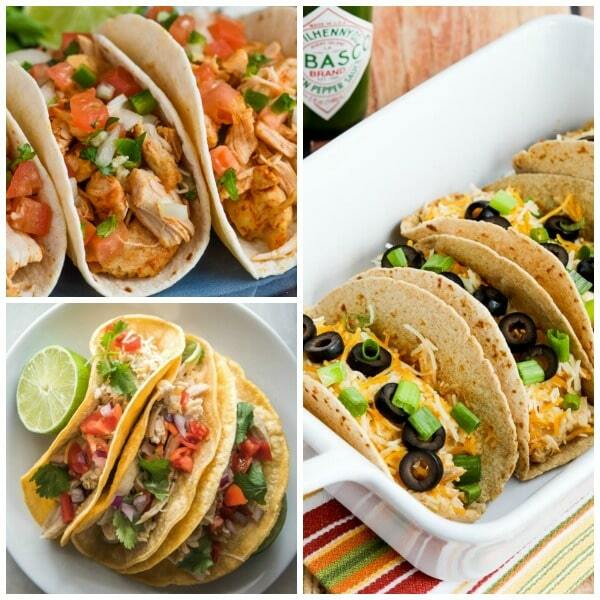 Moist and tender chicken is made into tacos that will loved by the whole family! Instant Pot Spicy Pineapple Chicken Tacos from Half Baked Harvest take tacos to the next level with pineapple juice, chunks of pineapple and Pineapple-Pomegranate Salsa! This is a must-try recipe! 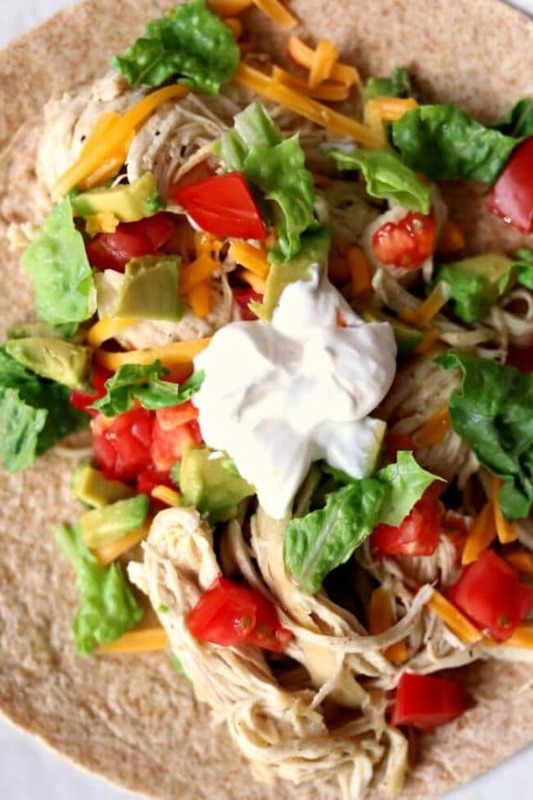 Instant Pot Mexican Shredded Chicken from The Cents’Able Shoppin is so full of flavor and perfect for tacos, a taco bowl or tostada. It’s so incredibly easy to make using the Instant Pot, and definitely a time saver! 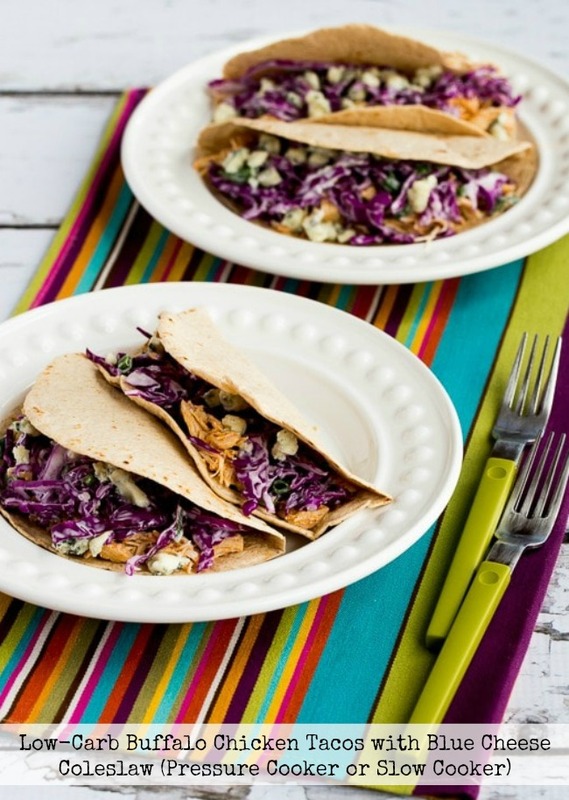 And finally, these Low-Carb Buffalo Chicken Tacos with Blue Cheese Coleslaw from Kalyn’s Kitchen can be made in the slow cooker or the pressure cooker, and Buffalo chicken fans will love this one. 20 Amazing Slow Cooker Summer Dinners! Thanks for taking the time to comment on Slow Cooker or Pressure Cooker! We love hearing from fellow slow cooker or pressure cooker fans, especially if you’ve tried or plan to try one of the recipes featured here. Sometimes comments won’t show up until we publish them. Thanks for understanding! And if you really like a post, Pins, Shares, Tweets, and Yums are always appreciated! All original text (C) Copyright: 2012-2019 by Kalyn's Kitchen® LLC. Photos are copyrighted by and used with the permission of original sites. All rights reserved. Slow Cooker or Pressure Cooker is a participant in the Amazon Services LLC Associates Program, an affiliate advertising program designed to provide a means for sites to earn advertising fees by advertising and linking to amazon.com. Get the BEST Slow Cooker and Instant Pot Ideas!